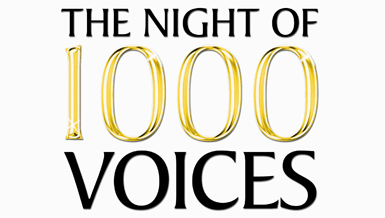 UPDATED 5th February 2012: The performers at The Night of 1000 Voices currently include Daniel Boys, Ricardo Afonso, Clive Rowe, Tiffany Graves, Kerry Ellis, Joanna Ampil, Edward Baruwa, David Durham, Yngve Gasoy-Romdal, Lydia Griffiths, Sophia Ragavelas, David Michael Johnson, Katie Rowley Jones, Caroline Sheen, Sally Ann Triplett, Tabitha Webb, Peter Polycarpou and Bonnie Langford (in a special number choreographed by Andrew Wright). Hugh Jackman and Anne Hathaway have intimated that they will participate if they can, but they are at the mercy of the shooting schedules for the LesMis movie. The evening will be hosted by Christopher Biggins. The annual fundraising concert for Leukaemia & Lymphoma Research will be held at the Royal Albert Hall on May 6th. The concert will be celebrating the Best of British and will again be for the benefit of Leukaemia & Lymphoma Research which is dedicated to saving lives through leading UK research into better treatments and cures for leukaemia, lymphoma and mycelia. The charity receives no government funding and relies entirely on people coming together to fundraise. Director Hugh Wooldridge revealed that the concert will feature numbers from musical theatre favourites including Evita, The Lion King, Jesus Christ Superstar, Les Miserables and We Will Rock You.